Paspalum gayanum , E. Desv. Panicum vaginatum , (Sw.) Gren. & Godr. Rottboellia uniflora , A. Cunn. Paspalum inflatum , A. Rich. Paspalum littorale , R. Br. Paspalum vaginatum , Sw.var. reimarioidesChapm. 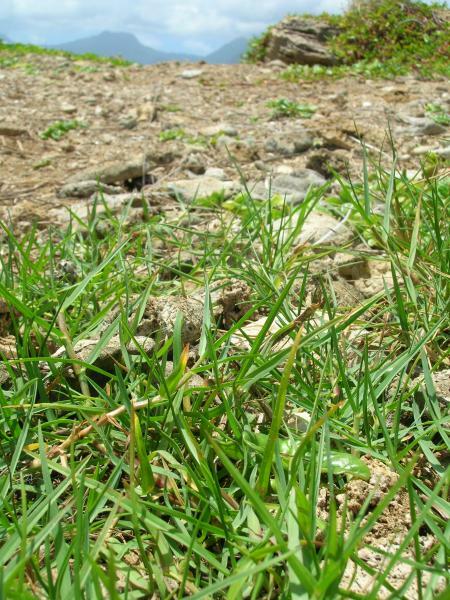 Digitaria tristachya , (Leconte) Schult. Paspalum distichum , L.var. vaginatum(Sw.) Griseb. Paspalum vaginatum (seashore paspalum) is a North American grass which now has a pantropical distribution. It has been widely used for landscaping and revegetation and is a common turf grass on golf courses. Paspalum vaginatum has naturalised in coastal salt marshes where it changes the composition of vegetation and in some cases dominates, impacting on fauna communities and estuarine hydrology. 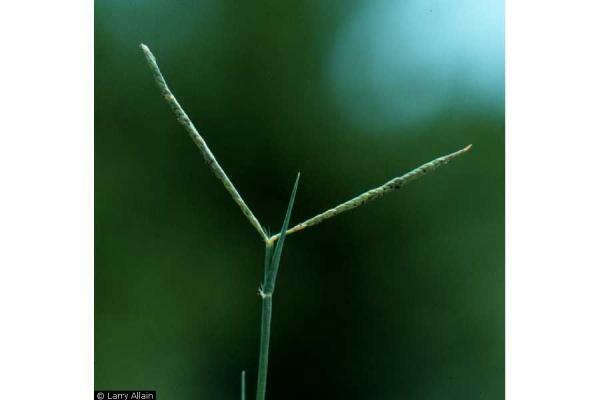 \"Sheaths often keeled, with small auricles; ligule membranous, ca. 0.5 mm long, with a ring of soft white hairs behind it, the hairs sometimes up to 5 mm long; blades usually stiff, ascending at an uniform angle, 2.5-15cm long, 3-8 mm wide at base, narrower than summit of sheath, apex attenuate, involute, base abruptly contracted. Racemes 2 (-5), opposite or closely approximate, at first erect and appressed together, usually spreading or reflexed at maturity, often subfalcate, 1.5-7.5cm long, rachis naked at base, 1-2 (-2.5) mm wide, triangular, flexuous, margins minutely scabrous; spikelets pale, solitary, imbricate, oblong, 3-4.5 mm long, 1.2-1.5 mm wide; first glume rarely developed, second glume and first lemma equal, thin, 3-7-nerved, the midnerve of both usually obscure, glabrous; first lemma usually transversely undulate, sometimes conspicuously so; second lemma convex, usually 3-5-nerved, apex with a few short, stiff cilia, otherwise glabrous; palea flat, 0-2-nerved, similar to lemma. Caryopsis narrowly obovate, slightly concavo-convex, 2.5-3 mm long, subacute\"
Haynes et al. undated state that seashore paspalum (Paspalum vaginatum) makes a high-quality turfgrass because of its minimal fertility and pesticide requirements. Furthermore, its tolerance of a wide range of conditions such as drought, saline or recycled water, varying soil pH, extended periods of low light intensity, flooding or extended wet periods as well as its resistance to insects, disease and wear mean it can be planted and grow where other species would not survive. It is frequently used in landscaping and as a turf grass in golf courses. P. vaginatum has historically been used for erosion control, as forage food for cattle and horses, by wild geese for feed. It is also used for wetland restoration and site reclamation on oil and gas well sites (Gates, 2003). Loch et al. 2003 suggest that P. vaginatum is suitable for use as a part of the management of salt-affected lands in Australia. Again, its saline-tolerant and overall survivability traits make it stand out from other turfgrassses. Seashore paspalum (Paspalum vaginatum) can be found in the coastal salt marshes of the tropics and sub-tropics (USDA-GRIN 2007). In various islands in the Pacific region, P. vaginatum is found in coastal sunny areas, near beaches and sometimes on the beach, in brackish marshy areas and mangrove swamps (PIER, 2007). It is best suited to compacted inorganic marsh soils of moderate salinity (USDA-NRCS, 2007), and is tolerant of drought, salt, a wide range of soil pH, extended periods of low light intensity, and flooding or extended wet periods (Haynes et al. undated). Recommended citation: Global Invasive Species Database (2019) Species profile: Paspalum vaginatum. Downloaded from http://www.iucngisd.org/gisd/species.php?sc=1351 on 21-04-2019. Seashore paspalum (Paspalum vaginatum) can alter ecosystems in a number of ways. It can form dense monospecific groundcover in brackish marshes and estuaries, and alter the composition of native species. This can lead to changes in invertebrate communities - in the Galapagos it is associated with a move from aquatic to more terrestrial communities (Siemens, 2005), and this in turn can impact on foraging habitat and food resources for waterbirds. In addition, invasion of P. vaginatum is associated with an increase in sediment accumulation, changing hydrology in New Zealand estuaries (Shaw and Allen, 2003; Graeme, 2005a, b). Preventative measures: A Risk Assessment of Paspalum vaginatum for Hawaii and other Pacific islands was prepared by Dr. Curtis Daehler (UH Botany) with funding from the Kaulunani Urban Forestry Program and US Forest Service. The alien plant screening system is derived from Pheloung et al. (1999) with minor modifications for use in Pacific islands (Daehler et al. 2004). The result is a score of 7 and a recommendation of: \"Likely to cause significant ecological or economic harm in Hawaii and on other Pacific Islands as determined by a high WRA score, which is based on published sources describing species biology and behavior in Hawaii and/or other parts of the world.\"
Mechanical control and grazing is not an option, as plants will resprout from fragments. Shaw and Allen (2003) recommend that vegetation development be monitored with permanent plots before control is considered. The information available for control of cord grass (Spartina spp.) in New Zealand is probably also applicable to P. vaginatum. Please follow these links to view complete profiles of Spartina alterniflora and Spartina anglica, including management information. Informations on Paspalum vaginatum has been recorded for the following locations. Click on the name for additional informations. City of Cape Town. 2002. Two Rivers Urban Park spatial development framework and phase 1 management plan. Final Draft. Cape Town Administration, Environmental Branch. Summary: This management plan details the restoration aims for Two Rivers Urban Park in Cape Town, South Africa. Guezou, A., Pozo, P. and Buddenhagen, C. 2007. Preventing establishment: an inventory of introduced plants in Puerto Villamil, Isabela Island, Galapagos. PLoS. 2 (10): e1042. Summary: This paper discusses invasive plant species on Isabela Island (Galapagos) and makes recommendations for control and eradication. Shaw, W.B. and Allen, R.B. 2003. Ecological impacts of sea couch and saltwater paspalum in Bay of Plenty estuaries. Department of Conservation Science Internal Series, No. 112-118, p. 18. May-June 2003. Summary: This report describes the ecological impact of P. vaginatum and makes control recommendations. Siemans, T. J., 2005. Impacts of The Invasive Grass Saltwater Paspalum (Paspalum vaginatum) on Aquatic Communities of Coastal Wetlands on The Galapagos Islands, Equador. Thesis. Allen, M., Walker, C. and Pen, L. 2000. Water notes for wetlands management: Advisory notes for land managers on river and wetland restoration. Water and Rivers Commission, Western Australia. Summary: This information sheet provides information about restoration of wetlands in Western Australia. Bakar, B.H. 2004. Invasive weed species in Malaysian agro-ecosystems: species, impacts and management. Malaysian Journal of Science. 23: 1-42. Summary: This paper discusses the invasive plant species that occur in Malaysian agro-ecosystems. Bambaradeniya, C.N.B., Ekanayake, S.P., Kekulandala, L.D.C.B., Samarawickrama, V.A.P., Ratnayake, N.D. and Fernando, R.H.S.S. 2002. An Assessment of the Status of Biodiversity in the Muthurajawela Wetland Sanctuary. Occasional Papers of IUCN Sri Lanka No. 3:iv-48pp. Summary: This paper provides an assessment of the biodiversity of the Muthurajawela Wetland Sanctuary in Sri Lanka. BirdLife International. 2007. BirdLife IPA Factsheet: SN001, Djoudj wetlands. BirdLife s online World Bird Database: the site for bird conservation. Version 2.1. Cambridge, UK: BirdLife International. Summary: This page outlines the conservation values and problems faced at the Djoudj wetlands in Senegal. Bjornsson, K.T. 2006. Narrung wetland management plan. Coorong District Local Action Plan Committee, Tintinara. Bradley, K.A., Woodmansee, S.W. and Gann, G.D. 2004. Inventory of vascular plants of Biscayne National Park. National Park Service Inventory and Monitoring Program. South Florida/Caribbean Network of Parks Inventory of Vertebrates and Vascular Plants. Summary: This document outlines the vascular plants found at Biscayne National Park in Florida, USA. Campos, J.A., Herrera, M., Biurrun, I. and Loidi, J. 2004. The role of alien plants in the natural coastal vegetation in central-northern Spain. Biodiversity and Conservation. 13: 2275-2293. Summary: This paper provides basic information about invasive plants in central-northern Spain. Department of Environmental Protection. 1999. Honeymoon Island State Recreation Area, Unit Management Plan. Division of Recreation and Parks, Florida. Department of Environmental Protection. 1999. Lovers Key State Recreation Area, Unit Management Plan. Division of Recreation and Parks, State of Florida. Domingues de Almeida, J. and Freitas, H. 2006. Exotic naturalized flora of continental Portugal - a reassessment. Botanica Complutensis. 30: 117-130. Summary: This paper lists the alien plants present in Portugal. Englund, R.A., Imada, C., Preston, D.J., Evenhuis, N.L., Cowie, R.H., Puttock, C., Arakaki, K. and Dockall, J. 2001. Native and exotic organism study Lower Wailoa River, Waipio Valley, County of Hawaii. Contribution No. 2001-014 to the Hawaii Biological Survey. Summary: This report presents the results of a detailed biological survey of the Waipio Valley on Hawaii Is. Gates, M. 2003. Seashore paspalum. USDA Natural Resources Conservation Service Plant Guide. Summary: This information sheet provides basic ecological and distribution information about P. vaginatum. Ghosh, A.K., Pattnaik, A.K. and Ballatore, T.J. 2006. Chilika Lagoon: Restoring ecological balance and livelihoods through re-salinization. Lakes and Reservoirs: Research and Management. 11: 239-255. Summary: This paper discusses the ecological problems facing Chilika Lagoon in India s Orissa state. Graeme, M. 2005. Estuarine vegetation survey - Kawhia Harbour. Environment Waikato Technical Report 2005/42. Summary: This report describes the vegetation at Kawhia Harbour, Waikato, New Zealand. Graeme, M. 2005. Estuarine vegetation survey - Port Waikato. Environment Waikato Technical Report 2005/41. Summary: This report describes the vegetation at Port Waikato, New Zealand. Hauraki Gulf Forum. 2004. Biological diversity of the gulf. Chapter 6 in Hauraki Gulf State of the Environment Report. Laegdsgaard, P. 2006. Ecology, disturbance and restoration of coastal saltmarsh in Australia: a review. Wetlands Ecology and Management. 14: 379-399. Summary: This paper talks about the ecological changes taking place in Australian coastal saltmarsh habitat. Nahonyo, C.L., Mwasumbi, L.B., Eliapenda, S., Msuya, C., Mwansasu, C., Suya, T.M., Mponda, B.O. and Kihaule, P. 2002. Jozani-Chwaka Bay proposed national park biodiversity inventory report. Department of Zoology and Marine Biology, University of Dar es Salaam, Tanzania. Summary: This reports on a biological inventory of the proposed Jozani-Chwaka Bay National Park. Pacific Island Ecosystems at Risk. 2007. Paspalum vaginatum. Summary: The PIER website provides an overview of invasive weeds such as P. vaginatum in the Pacific region. Robertson, A.I., Bunn, S.E., Boon, P.I. and Walker, K.F. 1999. Sources, sinks and transformations of organic carbon in Australian floodplain rivers. Marine Freshwater Research. 50: 813-829. Summary: This paper discusses the ecology of Australian floodplain rivers, including the vegetation composition. Sanz-Elorza, M., Dana, E. and Sobrino, E. 2001. Aproximacion al listado de plantas aloctonas invasoras reales y potenciales en Espana (Checklist of invasive alien plants in Spain (Iberian Peninsula and Balearic Islands)). Lazaroa. 22: 121-131. Summary: This paper lists the invasive and potentially invasive plant species present in Spain. Sanz-Elorza, M., Dana, E.D. and Sobrino, E. 2005. Aproximacion al listado de plantas vasculares aloctonas invasoras reales y potenciales en las islas Canarias (Contribution to a checklist of invasive alien vascular plants in Canary Islands). Lazaroa. 26: 55-66. Summary: This paper presents a list of the alien vascular plants of the Canary Islands. Serviss, G.M. and Sauers, S. 2003. Sarasota Bay juvenile fisheries habitat assessment. Submitted to Sarasota Bay National Estuary Program, Sarasota, Florida, USA. Siemens, T.J. 2005. Impacts of the invasive grass saltwater paspalum (Paspalum vaginatum) on aquatic communities of coastal wetlands on the Galapagos Islands, Ecuador. Summary: This thesis examined the impacts of P. vaginatum on Galapagos ecosystems. Starr, F. and Starr, K. 2006. Oahu offshore islets botanical survey. Prepared for: Hawaii State Department of Land and Natural Resources and Offshore Islet Restoration Committee. Summary: This paper presents the results of a botanical survey of the offshore Oahu islets. Starr, F., Starr, K. and Wood, K. 2006. Maui offshore islets botanical survey. Prepared for Department of Land and Natural Resources, Division of Forestry and Wildlife and Offshore Islet Restoration Committee. Summary: This report presents the findings of a botanical survey of the offshore islets of Maui, Hawaii. Swihart, T.I. 2005. Floristic study of the Upper Frio River, Texas. Unpublished MS thesis, Texas A and M University. UK Overseas Territories Conservation Forum. 2004. Review of existing and potential Ramsar sites in UK Overseas Territories and Crown Dependencies. Final report. Summary: This paper provides information on Ramsar sites in the UK Overseas Territories. United States Department of Agriculture. 2007. Natural Resources Conservation Service, Plants Database. Profile: Paspalum vaginatum. Summary: The USDA Plants Database provides information about the distribution of P. vaginatum in the USA. Summary: The GRIN database provides basic taxonomic and distribution data for a range of species. USDA, NRCS. 2008. Paspalum vaginatum Sw. The PLANTS Database (http://plants.usda.gov, 31 March 2008). National Plant Data Center, Baton Rouge, LA 70874-4490 USA. Vander Velde, N. 2003. The vascular plants of Majuro Atoll, Republic of the Marshall Islands. Atoll Research Bulletin, No. 503. Waller, D. and Barrett, L.C. 2000. Ossabaw Island Comprehensive Management Plan. Department of Natural Resources, Wildlife Resources Division.